The DCEU that we know today has been a series of ups and downs. Zack Snyder rebirthed the franchise with Man of Steel, followed it up with Batman v Superman: Dawn of Justice and Patty Jenkins introduced Wonder Woman before the grand culmination of the team in Justice League. The films that came out in a short span of time garnered mixed reviews from critics and fans. And honestly, I enjoyed them individually but as a whole story? It simply felt forced. Sure, we cannot set aside the pressure from Marvel Studios’ continuously expanding and fully laid out universe. With that said, DCEU tried a different approach with James Wan’s Aquaman. It deviated from the brooding vibe of the succeeding movies. Fans are even claiming that DC had gone Marvel because of the unusual levity and humor. Is that a bad thing, though? Hell no! That formula has been working for Marvel and why can’t DC do the same? Apparently, it is as if the executives agreed to do the same for Shazam! And boy, thank God they did because for the first time in my life, I finally had a great time watching a DC movie! Last March 28, Warner Bros Pictures invited The Little Binger to the special screening of Shazam! at the IMAX Theatre in SM Megamall. Red and yellow-clothed people packed the cinema to match with the theme of the screening. Honesty time: I was a little meek about seeing the movie because the trailers of Shazam! did not excite me much given the track record of the previous DCEU movies. My expectations were set really low and that made me realize how wrong I was! Going into the screening with a little knowledge about the character, I soaked up everything the movie has to offer and that’s one great thing about the film. As an origin story of the superhero, the story took time to flesh everything out about him and his kid alter ego Billy Batson. From an orphan to a superhero, the alternating transition in the narrative made up for a fun experience. As he discovers his abilities as one, we are also along with him. 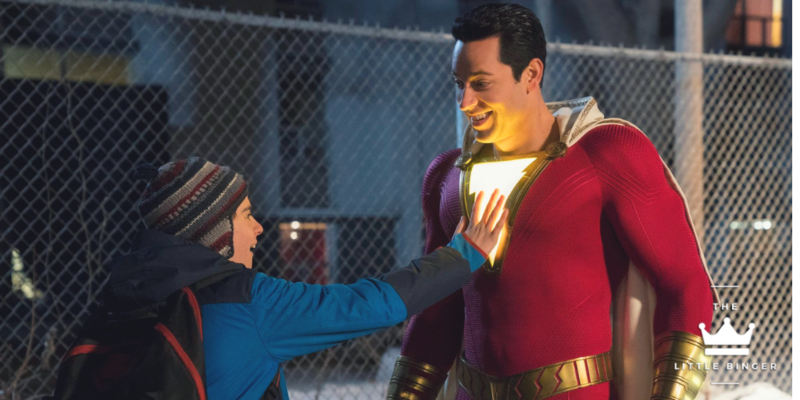 Zachary Levi and Jack Dylan Grazer’s natural comedic vibes set apart the film from its counterparts in the cinematic universe. No other actors could have been better for the roles. Beside the zapping and failed flights of a budding superhero, Shazam! also explored a familiar topic- family. Exploring Batson’s story as an abandoned orphan who has always been on a mission to find his way home added a touch of heart to the story. Surprisingly enough, a DC movie finally married the concepts of humor and drama without the cheesiness (I am looking at you Wonder Woman…”Love.” barf) Perhaps it helped that the characters were nicely written and the natural charm of the actors helped make things work. Despite the successes of the film, however, is one weakness- the villain. Mark Strong is a good actor but when you are given a weak character, you can only do so much. Dr. Sivana is obsessed on getting the power of Shazam! as he almost had it once as a child, if only he had a pure heart. The rejection and bitterness swallowed him and corrupted him as a whole thus the motivation to get the power. After years of research, he finally did and decided to take on Shazam! after. Convenient. This is just one flaw that can easily brushed off. Shazam! is easily the most fun I’ve had in a DC movie. The story had the essence of a comic movie to the core- it’s got humor and it’s got heart. It also did not hold back on the action as well. Most of all, there was the freshness that marks nothing but a promising beginning for the DCEU. Gone are the days of the brooding cinematic universe and now enters a fun and odd world for the DCEU! Honestly, I can’t wait to see where this is headed! PS: brace yourself for some kickass sequences!